Lopa Patel is a digital entrepreneur with a lifelong love of science and technology and an evangelist for STEM, innovation and bridging the skills gap in business. She founded the online South Asian Lifestyle portal Redhotcurry.com and ecommerce website TheRedhotshop.com. She is an experienced marketing consultant who previously set up the direct marketing services company DMS Direct Ltd, where she worked with international companies in a broad range of industry sectors. She is a Chartered Marketer and Fellow of the Chartered Institute of Marketing (CIM), a Fellow of the Institute of Direct Marketing (IDM) and a Fellow of the Royal Society for the Arts (RSA). Lopa is also the Founder & CEO of equality and inclusion think tank Diversity UK, Deputy Chair of global volunteering initiative Sewa Day, a Non-Executive Director of EMBG (Ethnic Minority Business Group) and a Trustee of educational charity Raha International. She is a Technology Ambassador for STEMNET, helping to encourage girls to take up science careers. She was previously a Non-Executive Director of Becta (British Education Communications and Technology Agency), a Board Member of social enterprise venture TSBC (The Small Business Consultancy), a Board Member & Trustee of Tamasha Theatre Company and a Mentor for Young Enterprise UK, assisting girls on the national entrepreneurship programme. 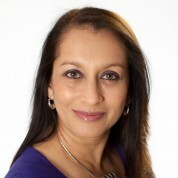 She is an inspirational leader and her outstanding record of achievement has been recognised through accolades including the ‘Windrush Award’ in 2003 (Outstanding Champion for the Internet & Technology), ‘Asian Woman of the Year’ in 2005 (Media) and an MBE for services to the creative industries in 2009. "I am delighted to be asked to be a judge for the Global Teacher Prize and fervently hope to inspire teachers of science and technology to be nominated. We are as a race at the frontier of innovation in health, wellbeing and environmental sustainability so it would be great to see a #STEM teacher win the $1 million prize. Teachers are the new super heroes!"